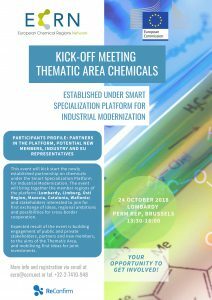 ECRN in collaboration with Lombardy and Limburg regions is organizing the kick-off meeting of the newly established Thematic Area Chemicals, which will place on 24 October 2018 between 13:30-18:00. The meeting will kick start the newly established partnership on Chemicals under the Smart Specialization Platform for Industrial Modernization. It will bring together the member regions of the platform (Lombardy (IT), Limburg (NL), Ústí (CZ), Mazovia (PL), Catalonia (ES) and Wallonia (BE)) and stakeholders interested to join for first exchange of ideas, regional ambitions and possibilities for cross-border cooperation. The meeting is expected to mobilize first priorities for joint investments and deepen the engagement of public and private stakeholders, partners and new members, to the aims of the Thematic Area. The event participants will discuss the key regional challenges that shall be placed on the agenda of the Thematic Area as well as the opportunity to expand to new regions. The meeting is hosted by Lombardy Region Representation in Brussels (Place du Champ de Mars 2). In case you would like to participate, please send an e-mail to [email protected], with your name and organization.